This is part of an ongoing series of aromatics and their culinary use. 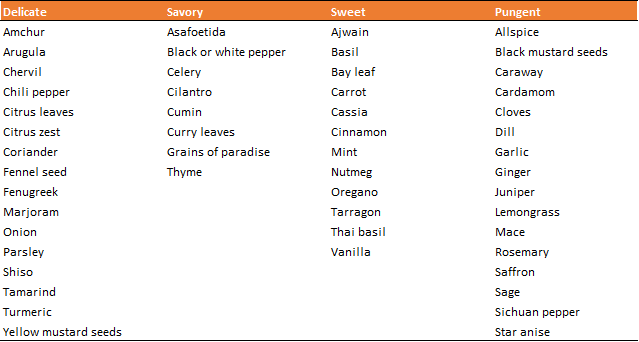 Other articles in this series include A Guide to Spice Blending, A Quick Guide to Herbs and Spices and Flavor Pairings. Next is an abridged listing of the aromatics that make up the four categories. Each aromatic within the four categories functions in relation to another as depicted in the figure above. Savory and sweet balance and harmonize one another while pungent is the insurgent that can enhance in small quantities but overpowers in large quantities, while delicate sits atop and nuances the other three categories. Keeping with our example, if we wish the outcome of our dish to be savory-forward, we should add the largest amount of savory spices, balancing their harshness with sweet spices. If we wanted to nuance or enhance the savory flavors further, we could choose to add delicate or pungent spices, respectively, although it’s not absolutely necessary. You can download this entire article as a quick reference PDF.